Saw your painting on Leslie's. Beautiful contrast and great theme! Thanks Pati, hoping to get the hang of these oil paints, it gets more fun each time I use them! Thank you Fannie, encouragement is THE most important part! Such gorgeous work, reminds me of how much I need to pick up my old paintbrushes again. Too fun, much better than the housework, cooking, cleaning I OUGHT to be doing :) You must pick up those brushes and join in ! How fun to see you already have two done. I've done my first and am tuckered out from all the work it takes to post and link and like and .........well you get it I'm sure. Love both of these but especially Blue Moon and from this distance it's hard to tell it's not your usual watercolors. I haven't done oil in years but loved it when I did it. Hi CheyAnne! I think the hardest part is thinking of names for the paintings. They will probably all be named after the country songs I listen to while I paint.... And I look forward to seeing your 30 in 30. These are wonderful Maria! Stunning! I never ever put forth any criticisms or critiques when someone works so much better than I ever could. These are beautiful and oddly enough, I thought they were watercolors! The oils are just so... gooey. And I make such a mess with them, I have paint everywhere!!! That might be half the fun ?! Love both of these Maria! Thanks Deanna. 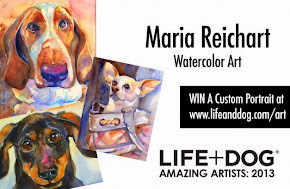 If I do too many oil paintings I will have to change my blog name from Maria's Watercolor to....something else!! love both of these Maria! The colors in "Blue Moon" really bring the painting to life. Of course "The Dance" touches myh heart. What a talent to evoke such emotion with your artwork. Oh,,Love your "Blue Moon". That's great that your trying oils, since you do so well with watercolor.. You'll have no problems getting hooked on oils.. thick whites vs thin dark washes Good Luck! Thank you Kelly! I think my favorite part of the oil paint is that the color doesn't get lighter when it dries, as the watercolor does. It keeps that brilliant, rich color. I love that!